Second only to the strawberry, the raspberry is a popular summer fruit. Raspberry plants are hardy perennials, easily propagated by seed. 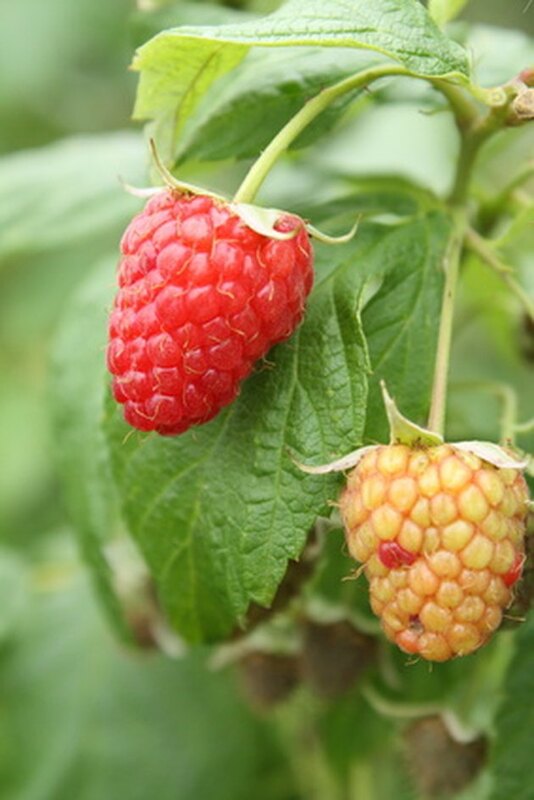 Preferring the sunny, well-drained soils of USDA hardiness zones 2 through 10, mature raspberry plants will grow to heights between 36 and 60 inches, with a spread of 24 to 36 inches. Raspberries will bear fruit in the summer of their second growing season when planted from seed. The raspberry is a popular summer fruit. Fill a seed starter tray with sterile potting soil in the early fall. Press one to two raspberry seeds ¼ inch down into the soil of each cell. Pat the soil down gently over the seeds to remove air pockets. Mist the soil lightly to dampen, using a spray bottle filled with water. Keep the soil moist throughout the germination process. Place the seed starter tray in a cool, dark area while the raspberry seeds germinate. The seeds will begin to sprout within three months. Set the seed starter tray in an area that receives bright, indirect sunlight once the seeds begin to sprout. If this is not possible, set up a grow light and place the seed starter tray underneath. Continue to keep the soil moist and provide the raspberry plants with adequate light as they continue to grow. Transplant the raspberry plants outdoors in the spring, as soon as the soil is workable. Select an area for transplanting your raspberries that contains full sun and well-drained soil with a pH between 5.5 and 6.5. Test the soil if you are unsure of your soil pH, using a soil testing kit purchased from a garden center. Turn over the soil with a pitchfork after the final winter frost and add lime to the soil if the pH is below 5.5. Add peat moss if the soil pH is above 6.5. Add the required amendment according to label instructions. Dig holes for the raspberry plants that are comparable in size to their root balls. Space each hole 2 feet apart. Space rows 8 to 12 feet apart. Remove the raspberry plants from the seed starter tray, placing one raspberry plant in the center of each hole. Backfill the holes. Water the raspberry plants generously after planting. Use a soaker hose that will deliver deep watering. Water at a rate of 1 inch per week, keeping the soil moist at all times during the growing season. Cut the raspberry plants down to the soil line, using a sharp pair of scissors or pruning shears, in the late fall. Cutting the plants back will encourage growth the following spring. Fertilize the raspberry plants the following spring when they begin to grow again. Apply a 10-10-10 fertilizer per label instructions. Continue to keep the soil moist. Harvest the raspberries when they ripen in the summer.